Deja Vu: Church Elders - Four Grown Men - Make Video to Discredit Those who Seek to "Destroy Our Pastor"
UPDATE: As of 10/1/13, The Four Grown Men above have removed their video from YouTube - more Deja Vu! So the best you can do now is read the transcript, which Julie Anne Smith has posted here at her post from two weeks ago. Thanks Julie Anne! Readers: watch the 6-minute video here. You will see the four grown men above - four lay leaders in a modern evangelical church, make a video to discredit other men in their church who have dared to ask questions and publicly criticize their pastor, James MacDonald of the megachurch Harvest Bible Chapel. And they wrap up their teleprompter speech by threatening church members with "great detriment" to their "souls" if they still associate with the Satanic men who are seeking to "destroy" their wonderful pastor. I'm not analyzing here the validity of the claims of the church critics whom these four grown men are going after - that is done quite well here by Dee and Deb - I'm here to analyze the pronouncements of the four grown men pictured above. "We need to communicate with you regarding the discipline of two former elders and their combined effort with other former elders, all outside Harvest working to discredit our elder board and destroy our pastor." "...have continued to spread discord through their false and unrelenting viewpoint." "...but they refused to submit to elder consensus, choosing instead to sow discord and create division. This is a very, very serious sin, one that we are told in Proverbs 6 that our Lord hate." "..the elders received a letter with 13 accusations against our pastor and his integrity, all of which the elders have already unanimously rejected multiple times"
"Scott Phelps and Barry Slabaugh have been notified that they are under church discipline and no longer welcomed in our church until they repent." "Together these men continue to lead and seditiously promote an attack on the credibility of the church elders, our governance of church staff and the integrity of our pastor"
"Their goal is to discredit our pastor and to divide this church." "Church matters are not to be tried in the court of public opinion. Publicizing viewpoints rejected by the elder majority, for any reason, is satanic to the core." "We warn the people of Harvest Bible Chapel to separate themselves from these false messengers. Don’t stand in the middle, don’t seek to mediate. Please avoid these former Harvest elders at all cost, lest you incur great detriment to your own soul." That last one is an outright threat to church members: "...lest you incur great detriment to your own soul?" For talking to "false messengers", i.e. men who have made serious claims about the finances of the church and the pastor? REALLY? It really is hard to believe that it is real, and that these four grown men's minds have become so corrupt that they believe what they are saying. Can these four grown men possibly believe what they are saying makes any sort of sense to rational, clear-thinking people? Try to replace the word "pastor" with "CEO", and "church" with "company". Would any of this speech about dividing, and discrediting, and discord, and destroying represent the way rational people think and believe and behave in the real world? Has church life devolved now into an alternate universe where men like this speak of fantasies and fables to warn people about critics of their pastor? Are these four grown men so blinded that they thought it a good idea to record a video with these claims, and then further to disseminate their claims on an Internet video? I have to say watching this video and reading the transcript of it is all so familiar to me. I heard all of the same nonsense over the past six years. Even my former church made a similar pronouncement - a "Deacon's Resolution" ratified by a smidgeon of church members - with similar pronouncements against me, claiming consensus amongst the "deacons", and seeking to warn others that if they did what I did, they too would incur the wrath of God and the church, and that public dissemination of "false criticism" was evil, yada yada yada. And they too, proudly broadcast their resolution on a live Internet feed, and then displayed the text of the resolution on the church website for all to see. Notice the four grown men don't get into the claims of the critics - nor did they in the Deacon's Resolution in my situation - that is because the claims don't matter. What matters is that public criticism of a pastor and church is itself inherently evil and sinful - as these four grown men say it is "Satanic to the core"...so why bother with the details of the claims? This is the stuff of cults, yes, of cults. We see it over and over when pastors and leaders misbehave: pastor is good, critics are bad, and the claims need not be discussed - especially if the "elders" or "deacons" claim consensus. Sad thing is, this all comes not from mega church pastors - but educated, grown laymen men who wouldn't ever dream of applying these standards, these principles, to any other area of their lives. They wouldn't implement these standards in their business, with their customers, with their employees, or in any of their civic affairs in government, business, or charity organizations. Only in the "church" do these fantasies of criticism being "Satanic", or demanding people disassociate with others based on their opinions, calling people "false messengers" or making pronouncements on behalf of the God of the universe - only in church do grown men like this dish this out, and only in church do the peeps tolerate this nonsense. And that is why so many non-Christians in our society fear us Christians - they see grown men like these - and gullible sheep like us who tolerate and thereby endorse such nonsense...and they have a very rational fear of US. And THIS is exactly why so many non-Christians who might consider the claims of the bible and Jesus Christ - have second thoughts and don't get very far. They see the alternate, fantasy world in which they would have to plunge, and they go another way. Last night First Baptist Church of Lindale (TX) hosted a James White presentation on the Ergun Caner scandal and what White calls the "Great Evangelical Cover-Up". White not only laid out clearly the decade long deceit of Ergun Caner, but he also explained in length how he himself became involved in the controversy. Fully understanding White's interest and purpose in helping expose the Caner scandal is quite helpful to anyone who might question the validity of White's claims concerning Caner. For those of you who have followed the Ergun Caner saga over the last 3 years, I highly recommend listening to FBC Lindale's pastors comments on the video that start at the 17:00 mark of the video, and end at the 25:00 mark. It is very significant to finally hear a Southern Baptist pastor call out Caner for his deception and fabrications. In his comments, Buck explains why he hosted the event. He expresses his concern over the "fabrications" of Ergun Caner, and the removal of videos and bios as a part of the Great Evangelical Coverup. He expresses concern over Caner's latest Tweets categorically denying the charges and claiming he has been exonerated. So my hat is off to Tom Buck for being as far as I know, the only SBC pastor to stand publicly and call for Caner to admit to his lies and deceptions. It is too bad that there are not 100s of SBC pastors who have the same concern Buck has for the integrity of his profession and his convention and for the Christian message they proclaim. I think White made a very wise decision in opening his presentation by playing a 10 minute excerpt of Caner's testimony that Caner delivered in a sermon back in 2006 at Thomas Road Baptist Church, with Jerry Falwell sitting behind him on the platform. I don't think I've ever seen this sermon before - and it shows that even in that very large venue Caner was not truthful about his background. This starts at the 32:00 minute mark of the video. Caner has the same phony Arabic-sounding dialect as he preaches, declaring that he came as a missionary. This sermon reminds me much of Caner's 2001 sermon in Jacksonville, with Jerry Vines sitting right behind him. "Before 9/11, he was 'Butch Caner'. He just went by the name Butch. Very shortly, I'm not sure of the date, was it First Baptist Jacksonville?...shortly after 9/11 all of a sudden he is asked to speak at a very, very large Baptist church, and this story starts to develop. And because of the fact that it was post 9/11, I mean all of us are sitting around going 'How and why did they do this?' Here comes someone who says 'I was trained in this, I know this, it's my background, I'm a Christian now.' And there was a real thirst for that. He's not the only one who's done this, by the way, in the sense of cashing in on the hysteria and unfortunately ignorance on the part of many Christians....and that's why he still gets to travel and do the things he does." Yes, Butch Caner became "Ergun Mehmet Caner" after 9/11 and with the help of the likes of Jerry Vines and Jerry Falwell Caner became an instant hit as gullible Christians (myself included) were seeking to make sense of the events of 9/11 in the context of our Christian faith. This is precisely why I was originally involved in this controversy on my blog - because myself and my family and extended family were present in that First Baptist Jacksonville sermon that launched Caner to stardom, as my pastor Jerry Vines nodded approvingly on the platform as Caner deceived Vines' entire congregation that day. It is too bad that Vines didn't do his due diligence in checking Caner out back in 2001. Three cheers for First Baptist Church of Lindale (TX), as tonight, Tuesday September 10th, they are hosting a presentation by Dr. James White on the "Great Evangelical Cover-Up" of Ergun Caner and his friends to discuss the harm Caner and friends has brought on modern evangelical Christianity. The banner above for this event was posted at White's blog site here. 1. This is the first time that I am aware of where a Southern Baptist Convention (SBC) affiliated church has taken a step to help expose the deceit of Ergun Caner from 2001 to 2010. Most churches are silent, or worse they still are booking Caner as a guest speaker or youth camp pastor. Finally an SBC-affiliated (and Southern Baptists of Texas Convention-affiliated) church is allowing from their pulpit the truth to be told about Ergun Caner and his SBC friends who have failed to hold him accountable for this "Great Evangelical Cover-Up". It was at the mega SBC church Prestonwood Baptist - about 100 miles from Lindale - that Caner delivered probably his most deceitful sermon ever right after 9/11 to transform himself from Butch Caner into "Ergun Mehmet Giovani Caner": the trained terrorist who barely knew English and wore a turbin when he converted to Christianity. It was a lie to establish his brand as an expert on Islam, and really a heretical exaggeration of the transforming power of Christianity. To read about the level of deception of this sermon, go here. "If you are a student at Arlington Bible College you are an honored guest [at this event]. Our understanding is that there on campus this has been the big 'no-no' topic. Do not ask questions, do not say anything about it [Caner's past deception], and so a lot of students are wondering: 'what's the real story?'. So we want to provide you with that information, we think you are owed that." This event is going to be live streamed at White's blog site through YouTube and/or GooglePlus. The event starts at 7:30 Eastern time, and the stream is supposed to be set up at 7:15 pm. "Looking at Ergun Caner and specifically looking at the 'Great Evangelical Cover Up' as well. We're not going to be spending the whole time just playing videos of Ergun Caner claiming to have been born in Turkey and raised in Istanbul, and coming here almost as an adult trained in Jihad and different Madrassas all over the Middle East, speaking Arabic and debating Muslims now in mosques and all the rest of that kind of stuff. No, we're not going to just be looking at that - we will need to lay that out. But once we lay that out we need to look at the attempted cover up on the part of others. We'll be looking at some of the most egregious excuses that have been offered for Ergun Caner, by Ergun Caner." We all expect Benny Hinn and Kenneth Copeland to preach a false prosperity gospel message. How many of us getting ready for church on Sunday run the channels and see these clowns on TV misrepresenting the Christian faith - telling people if they will send money God will give it back? That God can't bless them UNLESS they send money? We expect the likes of Peter Popoff to give us false promises concerning giving money and receiving blessings from God. But sadly, now many of those who laugh on Sunday mornings at Benny Hinn on TV drive Sunday morning to their churches only to find that the same teaching has now worked its way into their own local church! Some pastors will misuse the bible, will abuse their congregations and completely misrepresent the Bible and will present atypical testimonies of nameless givers who receive financial rewards based on the size of their gift to the pastor's church. Here in Jacksonville, this is going on right in the largest and fastest growing evangelical church in the city, Celebration Church. And the large numbers of young Christians who attend this hipster church are being misled by their pastor, Stovall Weems, and Robert Morris who Weems invited to speak at Celebration last month. 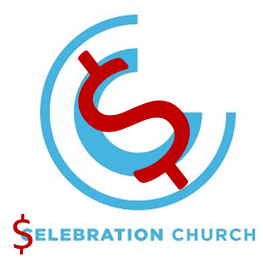 I want to call on Stovall Weems and the lay leaders of Celebration Church to denounce the false prosperity gospel that has been entered their church. Please, Stovall, renounce this nonsense. Is your church that desperate to raise revenues that it would resort to this? Have you become that greedy? Admit that this teaching hurts Christians financially, that it is spiritually abusive - and ultimately when the young Christians who are buying your nonsense now wake up and realize they've been lied to, they may very well leave the faith altogether. Lay leaders at Celebration: confront this issue head-on with Stovall. You know what you saw last week from Robert Morris, and his phony-baloney teaching is NOT what your church is about in this community - or is it? Your church is better than that, and you need to do a much better job of screening the speakers that you bring to Jacksonville. In the video below you will see four clips that demonstrate what I'm talking about. The first one is Stovall Weems himself promising that if the church members will tithe, God will financially bless them. In the next three, Robert Morris gives three stories of people from his church that gave large gifts to the church, only to have God "miraculously" return the money to them. Morris' implication from the three testimonials he recites is clear - it is no implication at all - it is a direct claim: if you give at or over the 10% level (to your church, of course), God will miraculously bless you financially. If Robert Morris were selling a product on TV, he probably could be sued by the Federal Trade Commission for false advertising. An advertiser can not give non-typical consumer testimonials of the benefits of a product that are not typical of the average consumer - unless they put up a disclaimer that gives the ACTUAL results that can be expected. Since 2009, the FTC has ruled that not even a "Results not typical" disclaimer on the screen would be sufficient consumer protection from outlandish claims in atypical testimonials. But of course, this is the wacky world of modern evangelicalism, where just about any financial claim can be made to get the peeps to fork over more money - with very little accountability and transparency on how it will be spent. We see Kenneth Copeland do it - but now we see pastors in large evangelical mega churches doing the same thing. The Bible continues to be used by professional religious men to build religious empires and enrich themselves and their family members, by using lies and deception mixed in with Jesus Christ to trick those who desperately want - that desperately need - God to bless them. It is what Martin Luther fought against 500 years ago: religious hucksters trying to peddle their religion to make a buck and build an empire with phony and false promises. They were called "indulgences" in Luther's day. But this deception is back with a vengeance in 21st century Christianity - complete with slick marketing and social media to promote it - and there is no Martin Luther around to stop it. Perhaps no one cares anymore - we just let the gullible be the gullible. But maybe the lay leaders at Celebration can do something about it at their church. I hope they will. The New Prosperity Gospel at Celebration Church - Stovall Weems and Robert Morris from FBCJax Watchdog on Vimeo.